In Ep. 010 of Living With Money, Tim talks with Mollie Sperduto of Ginger Ninja Productions. Ginger Ninja Productions puts on comedy shows for fundraisers, community events, and more! Mollie talks about her background in comedy, why and how she started Ginger Ninja Productions, and what it’s like running her own business. Tim Mullooly: Welcome back to Living With Money. This is Tim Mullooly. 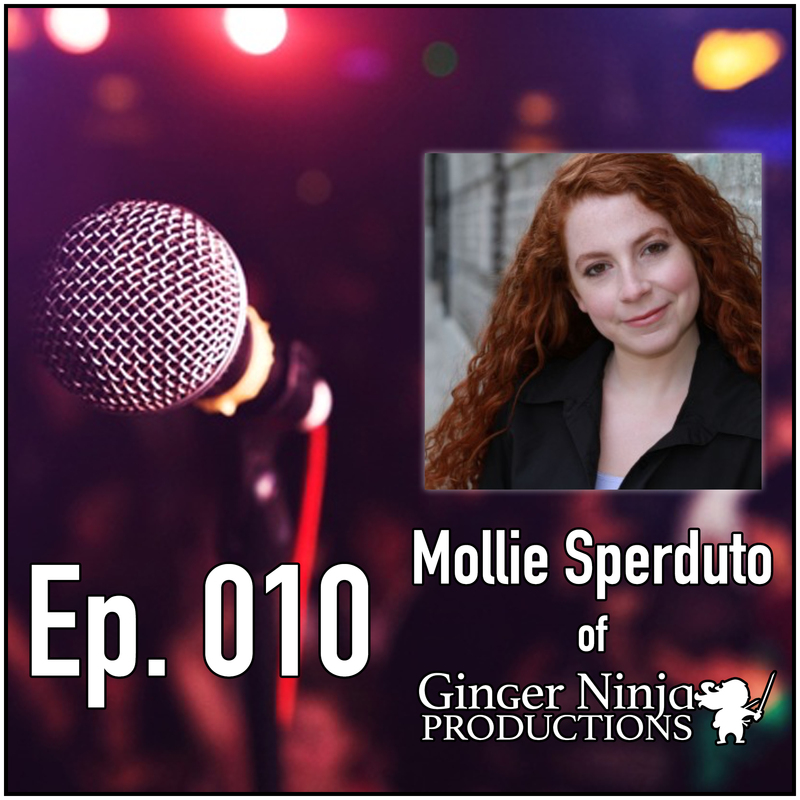 On today’s episode I have Mollie Sperduto from Ginger Ninja Productions. Mollie, thanks for coming on. Mollie Sperduto: Thank you for having me. Tim Mullooly: Ginger Ninja Productions produces comedy shows for all types of groups and organizations but before we dive into the production company, I just wanted to get a quick background from you, Mollie, on how you got started in comedy and kind of like what led you to that path. Mollie Sperduto: Well, I’ve been doing comedy for pretty much 15 years. I started when I was in high school. It’s almost kind of a funny question to ask because people are like, “Well, what were you doing before you did stand up?” I’m like, “Going to school. Learning multiplication tables.” But I’d always been involved even in school. Like in the school plays, show choir, singing everything else, so being on stage was never a stranger thing to me and I also liked making people laugh. Maybe not in such a public setting but even talking to friends and stuff, my favorite thing to do was make people laugh. So one day I put two and two together. There was a, some listing in the paper where they were looking for auditions for First Night Ocean county. It was like New Year’s Eve big variety show type thing, and they’re like, “We’re looking for jugglers and standup comedians” and a whole laundry list of things that I didn’t actually do but it still looked like something fun to participate in. So I was like, standup comedy, I’m going to try that. So I made an audition tape in my living room in front of three friends and it went about as well as someone at 15 years old doing standup in their living room for the first time would have gone. So I didn’t actually get a spot, but I realized I liked doing it. I liked writing the jokes. I liked performing and I wanted to continue doing it and I never stopped. Tim Mullooly: That’s awesome. I always like to watch comedy specials on like Netflix and stuff and I wonder how people got started and also what the process is for writing jokes. Is it just, do you sit down and think of things or is it just like, everyday life inspirations to help you get to your jokes? Mollie Sperduto: For me, it’s the latter of what you just said. It’s thoughts that pop up and I’m like, oh, that would make a really good joke. And every single comedian I think has a different process to what they do. Some write down, some record, some, there’s the old Mitch Hedberg joke where he says that he kept a notebook by him so that anytime he thought of a good joke he would write it down if he didn’t have a notebook and he worried about forgetting the joke he would just convince himself that it wasn’t funny enough anyway. But one of the goals that I have as a comedian is to eventually get in the process of doing, as you explained in the first option of writing down and even if it’s not a fully formed joke to write down ideas and get into the habit of doing that regularly. Because I feel it’s those people that tend to be able to come with new material much more often. Even if not every single thing is a winner they’re still writing, they’re still doing what they can. Tim Mullooly: Putting the ideas down and working through it. Mollie Sperduto: Exactly, and the more ideas that you get and try, the more winning ideas you’re going to wind up with. Tim Mullooly: After deciding to become a comedian, what made you decide to start Ginger Ninja Productions? Mollie Sperduto: So, it’s actually one of my favorite stories. So as I was performing standup, I realized that a lot of the shows that I was performing on were being run by my own peers. So I thought about giving it a spin and so the first show that I had started to run was basically a glorified open mic. It was, you know, new talent and a sign up as you go along type of thing, at 10 PM on a Sunday night in a dive bar in the outskirts of New Brunswick. So it was, the best thing that I could have asked for. But I was doing that and it was the summer right after I graduated college in 2008 and at the same time I had done what every single person would have ever advised me to do as someone who wanted to be a standup comedian, find a fall back. So I’d gone to school with a journalism and media studies degree, thinking, you know, I’m going to have my main career as working in television. I wanted to become a production assistant and work my way up the ranks. And in 2008 we were in the recession and no one wanted to hire anyone for anything. So I’m applying to these jobs that I thought I was going to be able to get and never getting anything back. Meanwhile, I’m promoting this, quote unquote, show that I was putting on every week on Facebook and the like and someone would reply back to me saying, “Oh you’re running shows now. My brother just opened a café, can you run shows there?” And that kept me busy for three years without even trying to promote or advertise myself. And I found such a job and then a couple years later, I was able to quit it and do this full-time. And I love it cause it’s just the irony that my fall back actually wound up requiring a fall back which was the thing that I wanted to do in the first place. Tim Mullooly: Right, exactly. Everyone said to have a fallback for comedy, but that ended up being the fallback for the real job. Mollie Sperduto: Exactly, and it also just kind of proves that if there’s something that you want to do and you’re determined to do it, it will find its way, no matter what. Tim Mullooly: Right, as long as you’re passionate about it, you can make it work. Tim Mullooly: What would you way are some of the more difficult challenges you had in terms of starting your own business? Mollie Sperduto: Definitely the fact that I was running a business at all, because I had always wanted to get into the comedy industry for sure, but running a business was never anything that crossed my mind. So I had never taken any business classes at first. I didn’t know how that was supposed to go. I kind of backtracked a little bit and took a couple of like the entrepreneurial classes and stuff through some of the county colleges just to make sure that I was doing everything right. But I would say that as far as the challenges, it’s mostly that back end stuff. Transitioning from working in an office to when I finally started on my own to working out of my house and trying to not get distracted by my cats or what not. And also the self-discipline behind working for yourself, as well. So it’s a lot of those soft skills that I found more challenging. When it comes to the shows I think that’s the only thing, the only time when I know what I’m doing. Tim Mullooly: So on the flip side, what would you say is the best part about owning your own company? Mollie Sperduto: I like being able to use the thing that I’m most passionate about to be able to help others. So, I know we’re probably going to get into this a little later, but prominently, I put shows on for fundraisers. And not only do I enjoy being able to get paid to sit in a room and enjoy comedy shows whenever I want to, but the fact that I can sit down with these clients of mine and potential clients and hear about their stories and hear about what they are doing to help people in our own backyard and to know that I’m doing something to help them continue to make the impact that they’re making is extremely heartening and not exactly the path I initially expected when I was starting to do this. But it’s certainly a byproduct that has kept me hooked in. Tim Mullooly: Right, definitely, you know, it makes you feel better putting on shows that are for a good causes or raising money for good organizations. Along the same lines you said you put on mostly fundraisers, what other kind of shows do you put on? Do you do stuff for like individuals, or is it just companies? Mollie Sperduto: I do, I would say, next in line is some corporate and business events. So sometimes I’ll do like a business networking group or chamber of commerce wants to put something together for their group or occasionally I’ll get like an insurance company that’s doing a presentation, they want a comedian to come up because after they tell you that you’re never going to retire, they want to make you laugh. But I also can be available for private parties, but I’ve never really gotten that kind of a request yet. But about the closest that I come to private type events are for like clubs, yacht clubs and things like that there. Where it’s still kind of a public show, but really not open to the public. It’s exclusive. Tim Mullooly: So what is a typical show for you like? Like do you have, is it just one comedian or do you have a group of comedians come up and a full schedule? Mollie Sperduto: So, a standard show would be, generally, three comedians. Hour and half to two hours and it usually has the headliner, who’s the main event. The feature who opens for the headliner and the MC who is the host. So they perform a couple of the show’s administrative duties of introducing the comedians and warming the crowd up and the like, while also at the same time, being funny. I’m like, well then you don’t want people sitting down for two hours in addition to everything else you’re doing. Tim Mullooly: You have to squeeze into their time constraints. Mollie Sperduto: Yeah. I wouldn’t recommend anything less than a half hour for a show but aside from that. Tim Mullooly: You don’t want to rush it. Tim Mullooly: If someone were to want to book a show with you, what would that process would that be like? What kind of details would you need from them in terms of getting the show started? Mollie Sperduto: Not a whole lot. Usually as long as we’ve got a date and a location locked down. The other thing that I do make sure that I get from them is what they want in terms of content and vulgarity because there are some groups that want cleaner. I’ve done shows for churches before. Tim Mullooly: Naturally they want cleaner stuff you’d think. Mollie Sperduto: Yeah, no Andrew Dice Clay. Mollie Sperduto: And there’s some folks that are on the other end where we’re all adults, we’re only going to do 21 and over so the sky’s the limit. It’s just as important to put on the show that they want as well. Tim Mullooly: So you mentioned Andrew Dice Clay, I wanted to ask you, who are some of your personal favorite comedians? Mollie Sperduto: I love Louis Black. He is definitely my favorite of the favorites. I met him once and he called me a psycho and it was the greatest moment of my life. Tim Mullooly: Coming from him I feel like that’s probably a good compliment. Mollie Sperduto: Absolutely. A lot of my other favorites tend to be some of the guys that I book a lot but they are all locals that if I mentioned names to you unless you really frequent comedy clubs when you’re not here, you probably wouldn’t have heard of. Tim Mullooly: Kind of piggybacking off that, how do you find the comedians that you book for your shows? Do they come to you? Or do you have to go out and scout out the talent and see if they want to become part of your company? Mollie Sperduto: Eventually I’ll probably have to do that but I’ve amassed a network of comedians just from my own time in the business. So at this time I have the comics that I need to book the shows that I’m booking and there’s always way more comedians out there than there are spots to put them in. Somewhere down the road as business grows and everything I may need to start looking on my own and actually scouting a little bit more but as of right now, I’m luckily not in need of doing that. Tim Mullooly: Nice. That’s good. Makes it easier. Tim Mullooly: So thinking back on all the shows that you’ve put on so far, what would you say if you could pick out one or two shows that stand out in your mind as highlights just to kind of a good story to tell? Any kind of shows that stick out in your mind? Mollie Sperduto: One sticks out and maybe because it’s very recent. But I’ve one comedian who is exceptional with working with the crowd and picking up on observations and doing callbacks to them throughout his set. And he had made some joke because when dessert and coffee were served before the show started, there were two vats of coffee and they were both labeled decaf. And as it turns out they were both actually decaf coffee, it wasn’t a mistake in labeling. So he had a million questions, like why not just put it in one vat? Why don’t you have caffeine? Someone gave him the explanation of it was at a church, the pastor didn’t drink caffeine so no one was able. So he just goes on about it for not in excess but just calls back to it every chance that gets to throughout his set. It was extremely effective. It was funny as is and later that night I always have comment cards on the tables for people to fill out if they have any opinions on the show one way or another and one of the folks that had filled one out had said, “Every time I drink decaf coffee from here on in I’m going to remember this night.” And I’m like, I have to good laugh out of that. I’m like as long as I’m making an impact. Tim Mullooly: Something to remember us by. Tim Mullooly: Before you were saying how people were telling you that you should have a fallback if you want to be a comedian full-time. What would you say to an aspiring comedian who is just getting started in comedy today? Mollie Sperduto: I would tell them to follow their dream and also to keep their mind open. Follow your dream because the only way that you’re ever going to succeed in comedy is to keep doing it. If you’re too scared or if you find any other reasons to back out of it then you’re guaranteed to not make it. But also I would say to keep an open mind because I feel like the culture of comedy has been shifting especially as the digital age has been taking place where if you go back to the 90s a lot of the hierarchy was you started working at the clubs, you got your name known then you started to get the MC spots then you started to work your way up. And you climbed up similar to a corporate ladder almost, you’d climb up that way. It has become less of a ladder and more of just a crazy flowchart where people are making their own way by using social media, making their own followers and making their own name for themselves without having to rely on a gatekeeper. There is the show with the William Shatner, Bleep My Dad Says where that started from someone’s Twitter account. Tim Mullooly: I didn’t know that. Mollie Sperduto: Oh you should probably follow it. It literally is just, I don’t even know if it’s, I haven’t looked at it in years but it was literally just quotes from his dad and they were always so funny. Mollie Sperduto: I’m pretty sure he had a connection or two to begin with but someone had reached out to him and they worked out a TV deal. All from a Twitter account that was entertaining. There’s thousands of ways to be able to make it in the business now. Tim Mullooly: Yeah, I feel like probably through things like YouTube and like you said, Twitter, you can really just get your name out there without having to actually go to these clubs and perform. So it’s definitely I feel like shifting the way that you can get exposed. Mollie Sperduto: Yeah. To see all the changes that have happened in the last 10, 15, 20 years also just is telling in that you don’t know what direction, there’s no telling what direction’s going to go in next. That’s why keep an open mind. See what’s happening. And also just follow along. Try to read articles and keep yourself informed on what’s going on with the business so that you can see what feasible, what’s not feasible and maybe find a way or get inspired to carve your own way. Tim Mullooly: Right. Be able to adapt and survive with the changes that come to the industry. Tim Mullooly: Now you said that you were, nerves weren’t really an issue for you but I feel like for, if you put me on stage to do standup comedy, I would clam right up. Do you have any tips or habits that you do that if you do get nervous to calm your nerves? Tim Mullooly: That doesn’t help. Mollie Sperduto: So yeah, that was my first time doing standup. I don’t really know if I have any tips per se but the thing that helps it go over for me is nowadays I regard it as a job. And it’s the thing that I know I know how to do it. People expect me to do it. I am in most cases being paid to do it. So similar to saying that back when I worked in an office job, I would never get nervous about going into work and doing data entry. Similar to this, it’s still fun, there’s still enjoyment in it but I don’t really get nervous because it’s the thing that’s expected of me. Tim Mullooly: It’s what you do for a living. Tim Mullooly: Right. If people come and work with you and your company Ginger Ninja, what’s the one thing that you would want them to remember after working with you? About you and your company? Mollie Sperduto: Aside from hopefully a hilarious, wonderful, enjoyable show, I also pride myself on having a customer service ethic that won’t quit. So I like to be remembered by having, being the person that they know cares about them and cares about they’re not just another project that’s X, Y, Z labeled. That I know them, that I work with them for them and keep their ideals, their goals, their personality in mind. Tim Mullooly: I meant to ask before, when you book a show with them do you guys provide all the equipment and everything for them too? Tim Mullooly: Makes it nice and easy for them. Mollie Sperduto: Exactly. And it also makes it easy for me as well because that way I don’t have to figure out how use someone’s sound system from 1970. Tim Mullooly: That is very true. I play in a cover band. Tim Mullooly: And we bring our equipment with us everywhere we go for the same reason. Sometimes when we show up to a bar or something that we’re playing at and they try and make us use their sound system it’s like reading a different language. You don’t know the equipment means or anything. Mollie Sperduto: Yeah, and one of the wonderful things about the circumstances I fell into is that my husband is, he graduated with an electrical engineering degree. I’m not the most technical person I know but if I have a question or anything I’m like, alright, here’s the problem that I’m finding or the thing that I want to do with the sound system now. Can this happen? Can you figure out how to make it happen? And preferably not for a fortune worth of money. Then he spends a night researching it, comes back to me and has all the answers. Tim Mullooly: It’s very convenient. Mollie Sperduto: So I call him my chief technical officer of the company. Tim Mullooly: So shifting gears from the questions more geared towards your company, we’re going to every guest we like to ask a handful of questions. First being, you gave some advice to aspiring comedians, if you could go back in time, say 10 or 15 years and give some advice to yourself, what’s one thing that you might do differently? Or what’s one piece of advice that you’d want to give yourself? Tim Mullooly: Where you are right now. Tim Mullooly: Enough to get you to the point of where you are now. Mollie Sperduto: Yeah. Sure I could’ve taken a different path and wound up just as happy but I don’t know that for certain. Tim Mullooly: Right. Kind of along the lines of finances and money, we also have these educational episodes where we teach people good personal finance habits because it’s not really taught that often in school. What’s one thing in particular that you wish that you knew in terms of handling money that you wish you were taught that back in high school? Mollie Sperduto: Completely honest, I wish they taught us literally anything having to do with real world. There’s memes about it that go around on the internet too about I have no idea how to balance a checkbook and I don’t know how do this, that or the other basic function of life but darn it I remember the Pythagorean Theorem. That’s certainly not to knock the education, I am thrilled with the education system and how I was taught, my teachers and everything else but I really wish that they’d implement some kind of a class even on basic money skills or basic whatever other life maintenance skills that are required to be functioning adult. Tim Mullooly: Right. They always, I remember teachers saying back in high school that, “We’re getting you ready for the real world.” But they didn’t teach us how to manage a bank account or even do basic, get your own taxes done. So I totally agree. There is a stat saying that only 13 states require high schools to have personal finance classes which is not very good. Hopefully if someone out there is listening and has some power to change that. Tim Mullooly: Please, yeah, help us. Okay, so last question we have here, what does making money through your company allow you to do outside of work that you’re passionate about? Mollie Sperduto: First and foremost, to say that the most important thing to me outside of my company is the people that are in my life. So spending time with friends, going on vacations and spending time with the people I love. And having money allows me to able to do that. To drive to get to them. Or to me and a couple of my friends, my brother and sister-in-law are all going on a cruise in a couple months. And so things like that that just add to the enjoyment of my life. Tim Mullooly: Great. So that’s all the questions that we have for today. Mollie, thanks for coming in I really appreciate it. Mollie Sperduto: Thank you very much for having me. Tim Mullooly: That was Mollie Sperduto from Ginger Ninja Productions. We’re going to link to her website in the show notes. If you have a need for a comedy show in the future, get in touch with Mollie and she’ll help you out with everything you need and put on a great show. If you’re listening to this on iTunes, please subscribe to the podcast to get new episodes every week. And feel free to leave us a review or a comment because it would really mean a lot to us. Be sure to follow us on Twitter and Instagram @lwm_podcast for more news and updates about the show.